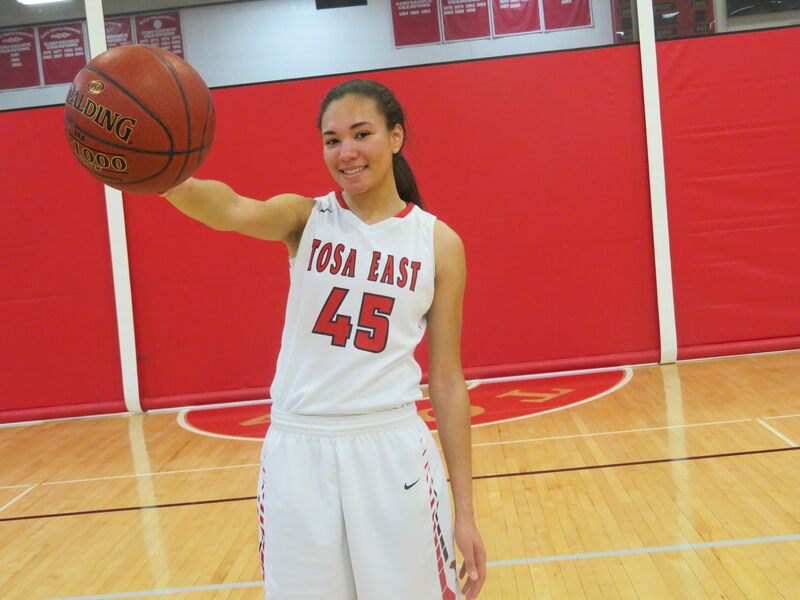 When Brooklyn Blackburn enrolled at Wauwatosa East High School three years ago, the athletic department had no idea they would be getting two athletes for the price of one. Then basketball coach Rob Hamill was familiar with Brooklyn's talents having watched her in the Tosa Basketball League growing up. 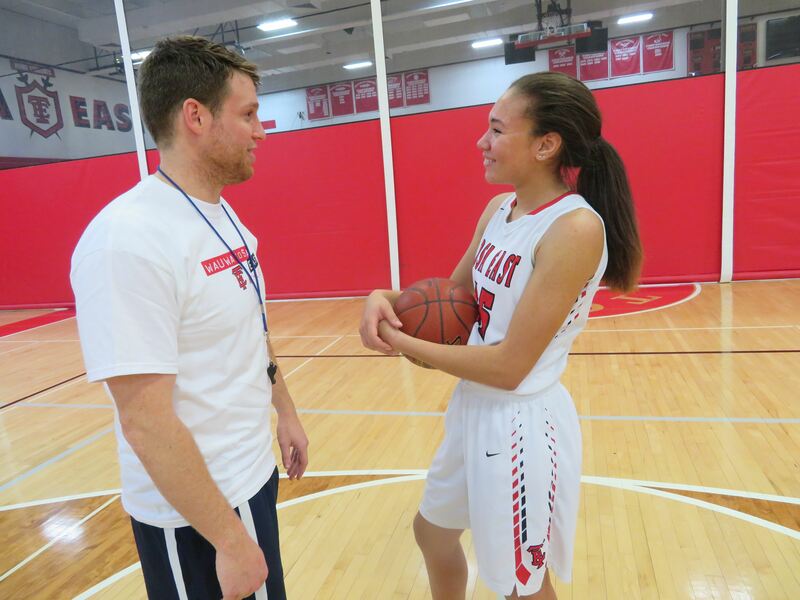 When Brian Hendricks applied for the open girls basketball job in the spring, he did research on Brooklyn and also found out she was a developing track star as well as being an outstanding basketball player. "I looked up the roster and saw two all-conference players (Blackburn, Liz Bueckers) returning," Hendricks said. "I said that's a good start. I then started Googling her and saw she was a great hurdler. So I started following newspapers article on her and followed her in another sport. I saw her play basketball all summer. I said we're getting a pure athlete." Blackburn finished fourth at state in the 100 hurdles as a sophomore and was part of the 4x400 relay (10th) and 4x200 relay team (20th). Since she never participated in track before her freshman year, I asked her why she went out. When asked the difference between basketball and track, she laughed. "Basketball is totally different, but speed helps," she said. "But basketball running and track running are totally different things." Although Brooklyn is the straw that stirs the drink, her teammates are the most important thing to her according to Hendricks. "Even as she progressed, it's become more team, team, team," the first-year coach said. "There were times when she was sick and played through it. When she was injured, she would sit on the bench and she was a version of me sitting on the bench. She's coaching the girls the entire time. Where a lot of players who are as good as she is get hurt, they possibly shut down and worry about their injury. "The other night Brook got hurt, sat on the bench icing her ankle then you could see Brooklyn hobbling all the way from the end of the bench, just to make sure she gets to the huddle. It's becoming more and more apparent as the year goes on with her." Photo by Tom "Sky" Skibosh --- Junior forward Brooklyn Blackburn tops the Wauwatosa East girls in scoring (15 points) and rebounds (8 .0) . She was honorable mention all-conference as a freshman and first-team as a sophomore. Mariana Ibanez-Baldor and Sydney Halstead are captains, but because of her attitude and talent Blackburn also does her part. "I think it's really important - being able to share my knowledge with others and to be able to carry the team in different situations," she said about being a leader. "Not only on the floor, but off the floor, being able to keep the team together. "If I see something I will say it. Or I will basically show someone. I'll say 'You do this instead of this. (When someone asks) it gives me self-confidence that means that I'm doing something right and someone wants to lead off of me. It makes me feel good." Hendricks sees the progress Brooklyn is making in that role. "I think she has grown more and more comfortable with leadership," he said. "Halfway through the first semester of the year, something clicked with her and it was a lot more leading by example. "We have a freshman on the varsity and she should take her aside and say 'You make this cut and here's why.' and then as 2018 hit, she's become coach Brooklyn. A lot has to do with trust in your coach and what can I (Brooklyn) say now. She is really believing in 'that's what's going on, I can help you guys.' The team looks to her and they believe in what she says now." In Brooklyn's first two years the Red Raiders were 17-8 overall, 7-7 in GMC, and 19-7 and 8-6. They are struggling this year going 6-8 overall and 3-6 going into the week. They are playing without senior Liz Bueckers, the other returning all-conference player because of a knee injury (time of return in question) and they lost their third all-conference player - Johanna Taylor - to graduation. It didn't take Hendricks long to see he had something special in Brooklyn. "I saw her at the first open gym of summer. We had a team meeting, I introduced myself and then I watched her on the court. When Brooklyn got the ball, everyone kind of stopped and watched. I said this is something we could really and truly build around. Watching her play, it was great, instinctual, very natural for her. Where other girls were still learning it just comes natural for her." Blackburn talked about her role and the team and what she enjoys the most. "I feel I'm an all-around player, so I can help everyone in different scenarios or different situations," she said. "I have the most basketball experience. I play here and AAU (1on1) year-round. I feel like I have a good basketball IQ. "What do I enjoy the most? I run the floor really well. I like transitioning and physical work. I like to get to other people. I like to read the floor. I like to make things happen, I guess. (When I get an assist I feel great. I feel so accomplished. With assists it's a great feeling to have when you do it. I like doing something for someone else and I think that's great." Hendricks couldn't wait to talk about her strengths. "She's fantastic on offense. She'll get the basket when she dribbles, there aren't many people in conference who can stop her 1-on-1," he said. "Anytime she gets the ball in the paint she's going to get a good look and she's probably going to score. We're moving her up to the wing now. She's so big (5-feet, 11 inches) and so quick on the wing it's going to be hard for post players to guard her. "She played post her whole life and we started her at wing and she's picking it up like nothing. It goes back to the quick learning and natural ability. I can tell her she's playing point guard this week and she will look at me and say 'Yeah, sure.' And then say 'OK, let's do it.' She'll figure it out. She'll give you a little goofy funny thing, but then at the end of the day every time you are talking to her she is actually listening." Photo by Tom "Sky" Skibosh --- First-year Red Raiders coach Brian Hendricks talked about how much Brooklyn Blackburn has matured since November. Blackburn also knows what the strong part of her game is. "I feel like I can score and I use my size to an advantage most of the time," she said, adding this about rebounding strategy. "You need to find a person, box her out and I have to actually jump in the air sometimes, especially against taller girls. I'm not the tallest one out there sometimes, so I try to establish a position to get a rebound. "I have to transition from a post to a guard sometimes. So being able to set up plays and ball handling, things like that I need to work on." Hendricks talked about another area Blackburn needs to work on. "Defensively, right now she relies on pure athleticism because she is so much more athletic than most people. If she can get down the fundamentals of defense - plus the athleticism. Being in the right spot at the right time with your feet, not just your hands. Fundamental stuff. She is going to be a total scary player." Hendricks then when back to Brooklyn and the way she cares about other people, especially family. "She's a kind person first and foremost," he said. "You can tell by the way she cares for her younger sisters (Bria, Brilee). She loves them so much. One (Bria) of them plays on our club team. They're at every game. They went to the West Allis Hale-DSHA game and Brooklyn took her youngest sister with her. She's goofing around sitting with her. She shows so much compassion for those two and she does that with everybody. "She's a kind, passionate person and she's a funny person. She knows when it's time to get serious. But if you're getting too serious she can throw a little joke in and loosen everybody up." Hendricks once again referred to her progress since the season started. "The maturity and growth I've seen from November through February has been huge and I think she's seeing that. As a coach it's exciting to see where this is going to end up. She has already matured as a player and a leader in two months here. So what is she going to do next year? It's going to be fun to watch." FAVORITE MOVIE: ​​'Freedom Writers'; Romance movies. MOST MEMORABLE MOMENT: ​Scored 40 points against Washington last season. WHAT DO YOU WANT TO DO IN THE FUTURE: Attend college and study pre-med (Physical Therapy).